Eugene Egan is a political activist campaigning on Palestine and Ireland and a writer whose work has been published in Palestine News. Around the world, U2 lead singer Bono is seen as the archetypal celebrity philanthropist, jetting across the globe campaigning against hunger and injustice in Africa and elsewhere. 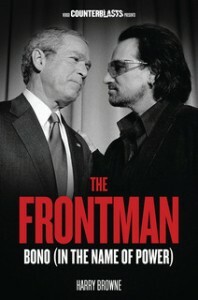 Harry Browne’s new book, The Frontman, unmasks a very different picture.